Okay, so on the long list of things I love about Phuket is the fact that you can eat looking out over the sea. And at Re Ka Ta Beach Club, your table’s almost right on the sand. The Club is beautifully designed, modern, minimalist and all in blue and white, even some of the chairs light up blue as the sun goes down. We visited once for a pre-dinner g&t, loved the feel of the place and discovered they had what looked like a really lovely restaurant menu. Only one thing for it, back we went for dinner. We were seated at the absolutely best table in the house, right at the end, two small steps from Kata Beach. Stunning. The chef’s called Bryan Burger and I found out later that he’s South African-born. If I’d known that at the time I’d have popped my head in to say hello! He focusses on using seasonal, local ingredients and his food was fabulous. Sitting by the sea, as we were, dinner simply had to be fish. Starters of seared scallops on mango, mint and 42 below vodka salsa and soft shell crab with mountain pepper tempura and sour dip and cucumber salad were the perfect start. 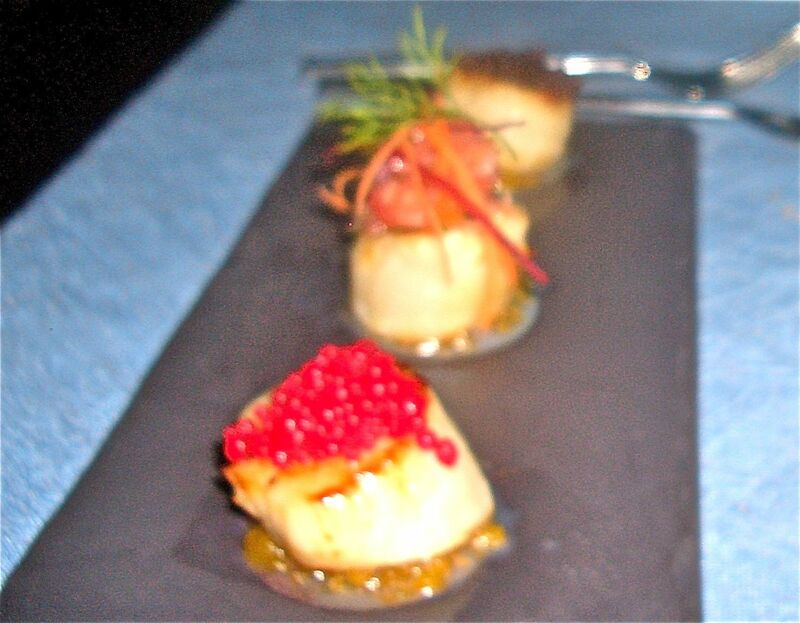 The scallops looked like a work of art and were beautifully cooked. 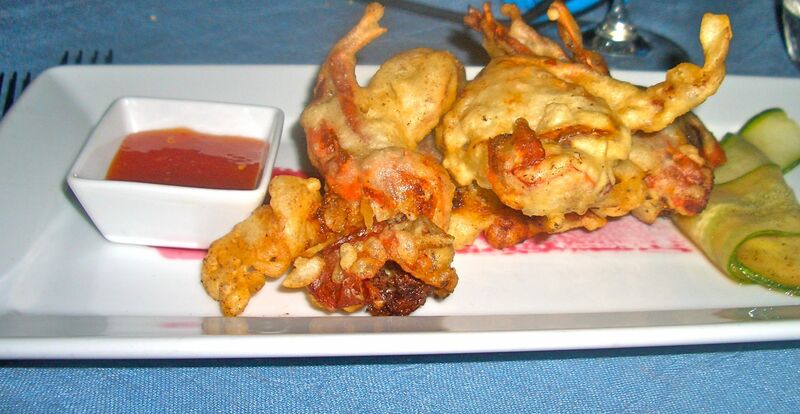 The crab was surprisingly meaty and delicious. 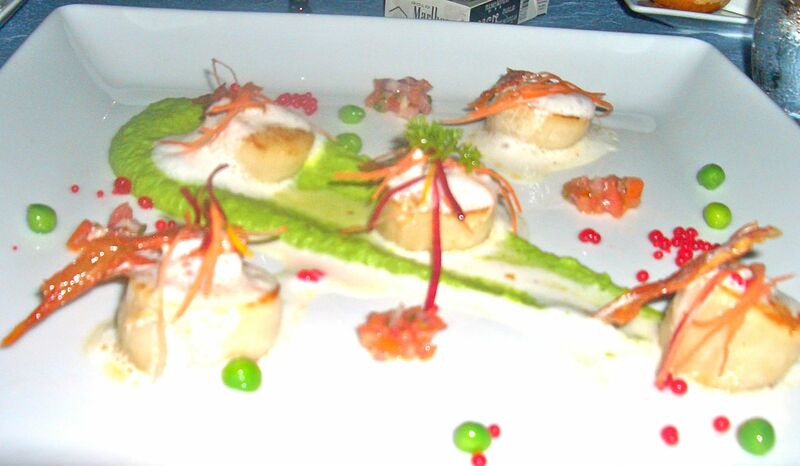 Main courses meant more scallops, this time with pea puree, shoots and cumin foam with air-dried serrano ham. The list read like my dream ingredients so I had to have it. Definitely on my list of best dishes I’ve eaten this year. So beautifully presented and each mouthful was a total joy. There’s a grilled section on the menu, which included the grilled sea bass with wok tossed greens served with Re Ka Ta signature sauces. 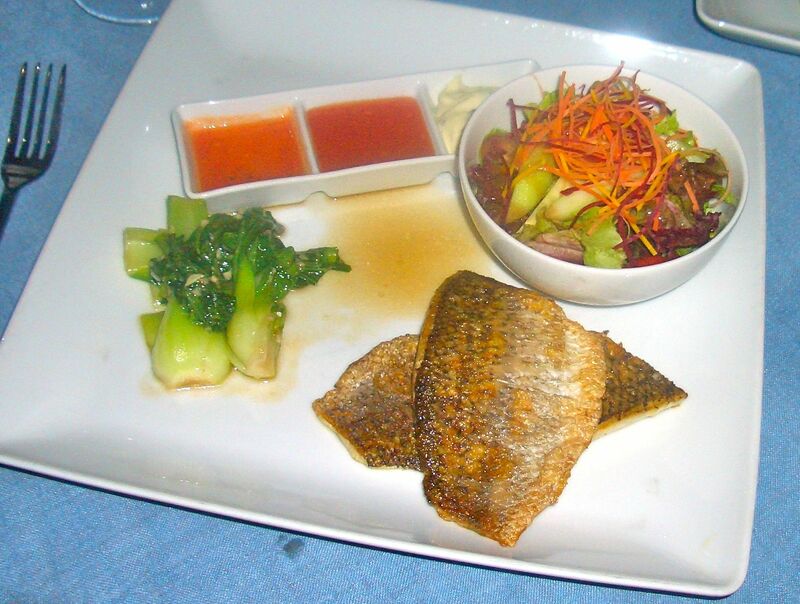 Perfectly cooked, sweet sea bass with three dipping sauces and a fresh salad. Phuket lobster is also available, and would you believe I asked the people on the next table if I could take a picture of theirs, as it looked so good. Couldn’t even believe my own cheek! Promise I won’t do that again. The lobster from the table next to us! In the land of amazingly cheap restaurants, this is a step up to the more pricey category for Thailand. Having said that, the sea bass was a mere £11 and my scallops just over £15 so still incredible value. Their salads sounded fabulous too, but sadly we ran out of time as it would have been perfect to step up from the sea and enjoy a light lunch.